ENSENADA, BC- Last Monday June 11, the Governor of the State, Francisco Vega de Lamadrid and the President of the Republic, Enrique Peña Nieto, delivered the Sea Water Dezalination plant in Ensenada, as part of the implemented strategies to reduce the deficit of drinking water in the northwest region, which will provide 250 liters per second (lps) of water to the population; likewise, in the municipality of Tecate, they delivered the expanded and modernized highway work that connects with Ensenada in the Tecate-San Antonio de las Minas section, benefiting thousands of Baja Californians. The State Executive explained that with the start-up of the Ensenada desalination plant, the safe supply of drinking water is guaranteed, adding to the more than 150 lps received through the Colorado-Tijuana-Ensenada river aqueduct; the state investment exceeds 260 million pesos (mdp), in addition to the 580 lps that are obtained through other sources of supply for human, industrial and agricultural consumption, which represent a total of 980 liters per second approximately for this municipality. Vega de Lamadrid stressed that the State Government has invested around 19.5 million pesos in complementary works such as the Gómez Morín neighborhood line to the 89 Popular Enlargement, the stormwater collector on Westman Street to La Lagunita on Pedro Street. Loyola and the channeling of the stream that feeds the Lagunita between the desalination plant and the Reforma Avenue, which were essential to start the operations of the plant. 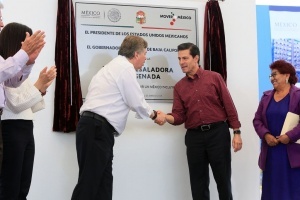 The Governor mentioned that with this source of water, the municipality of Ensenada will be able to consolidate its modernization and port activities, tourism, services, as well as diversify its industrial platform, consolidate the wine valley and extend social development, highlighting that this plant can be extended in a second stage to 500 lps. He said that a high percentage of the population does not have water supply 24 hours a day, and that is why, the different orders of government have come together to solve this lag, with the construction of desalination plants in Isla de Cedros, Beaches of Rosarito, San Quintin and on this occasion the one of Ensenada, which enters into operation after the first stone was placed in February 2014. During his participation, the President of the Republic, Enrique Peña Nieto, said that the issue of water is a priority issue for Baja California, because it is a desert region, and even more in the case of Ensenada, a municipality of migrants that came to these lands seeking better opportunities for personal development, because here the municipal, state and federal governments have come together to create these conditions. He stressed that Baja California has one of its great attractions in tourism, so it highlighted the infrastructure works it has carried out with the state government, such as the transportation system “Articulado Verde T”, as well as other educational, health and water infrastructure,. The General Director of the National Water Commission, Roberto Ramírez de la Parra, added that the only alternative to have the liquid is to desalinate seawater, he also said that this plant is completed and it’s in the stabilization stage, to corroborate the operation of its filters, of its tanks and starting the following week it will be delivering a third of water of its capacity so that by July 15 it is operating at its 100 percent capacity, in order to be able to supply water to Ensenada. The desalination plant of Ensenada represents an investment of 760 million pesos, 24% federal and 76% private.